Last week, on Thursday 4th April, we observed martyrdom of Zulfiqar Ali Bhutto, who was made ugly target of a military dictator Gen Ziaul Haq merely to fulfil his ulterior motives on the basis of baseless charges. It is said that when one can’t make history, one would prefer to rewrite it. That’s what we have been witnessing ever since the advent of Pakistan. Starting from the day when a Babu attempted to superimpose Quaid’s August 11, 1947 speech by censoring that portion that laid bare his vision of a democratic and secular Pakistan guaranteeing equality to all its citizens. Even the controversial Objective Resolution was an afterthought instrument by the later Lahore-based feudal conspirators who along with the West Pakistani power troika comprising military, civil and judicial bureaucracy backed by the renegade religious parties to convert Jinnah Sahib’s social welfare into a security state. Seventy two years down the road we are being once again subjected to a process to rewrite history onward where General Ziaul Haq left. Amending the title of Benazir Bhutto Income Support Programme (BISP) by the great visionary Imran Khan who cannot think of doing something big of his own-seems to be testing ground to replace pictures of the Quaid from the currency notes by ones own. Indeed, his cronies claim that he has qualities second only to Jinnah Sahib. Masha-Allah! In history one can do anything but hide the truth that ultimately surfaces sooner than later-advertently or in advertently. For example, Pakistani Establishment starting from General Ziaul Haq’s time, has been trying to claim credit for Pakistan’s nuclear programme denying Zulfikar Ali Bhutto his legitimate niche as its father who dared to defy the world, ‘eat grass’ and be killed by his Army Chief for giving Pakistan its nuclear deterrence that has made it invincible today. Indeed, in this context one is happy to note that in a recent interview with a Russian news agency, DG ISPR Major General Asif Ghafoor graciously accepted that Pakistan’s nuclear weapons was meant for deterrence purposes to prevent military escalation with India. Surely no two views about it. One agrees with Gen Ghafoor that nuclear arms have essentially eliminated the possibility of conventional warfare and are used as a political tool. As regards the reciprocity of a nuclear-free South Asia, he is right that Pakistan could only pursue a strategy for nuclear non-proliferation on the condition that India does the same. Ever since atomic bombs were used by the United States for the first time in 1945 against Japan killing hundreds and thousands, their deterrent existence has not been so far violated. After Zulfikar Ali Bhutto’s execution forty years ago on April 4, 1979 on fabricated charge of murder by General Zia, it has been an existence of unease, disruption, dislocation, ethnicity, divisiveness, sectarianism, never ending trauma of terrorism and ongoing tug-of-war between the establishment and the democratic minded people. Electoral engineering, selection in the name of election and resurgence of the Establishment as the solo player in the power play–shall continue to overcast our political future. Pakistan’s challenging predicaments demand serious reflection on the state of affairs. Bhutto had entered Pakistan’s politics in 1958 as the youngest minister in the government of Ayub Khan. He was a stranger in a cabinet that had generals and senior bureaucrats who had been in cahoots with each other to put their claim to power as the legal heirs to the British Raj. As opposed to them Bhutto was driven by his romance with democracy and freedom for the people as envisaged by his leader Quaid-i-Azam Mohammad Ali Jinnah. Having found a place for himself on a platform that was not favourable to vintage politicians, Bhutto chartered himself on a course that would give a new sense of direction to the country and a fresh meaning to politics. Bhutto in the government made his impact felt all around. As Minister for Fuel and Power, he introduced diverse explorers tapping into Pakistan’s underground energy resources. His time as Minister for Science and Technology was well spent. He could measure the advancements made by India in the atomic field. He gave a proper sense of direction to the Pakistan Atomic Energy Commission, set the nation on the mission towards acquiring nuclear deterrence. Had not the American lobby in Ayub government subverted his scheme of things, Pakistan would have acquired the nuclear capability much before India tested its atomic bomb in 1974. Bhutto was known for an extra-ordinary penchant for international politics. As a minister in 1958, he found Pakistan tied to the apron strings of Washington. Later Gen Zia and Gen Musharraf–had become collaborators in the American geo-strategic interests. Pakistan owes not only its nuclear arsenal including missile technology entirely to ZAB and Benazir Bhutto, it was ZAB who saw Pakistan’s sound defence in an independent solid industrial base. 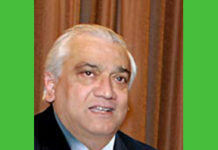 He established aeronautical and heavy machine tool complexes, Pakistan Steel Mill, Karachi Shipyard, Karachi Nuclear Power Plant and its automobile industrial base. In his vision sustainable defence was dependent on a small but strong well-trained standing army armed with variety of missiles and backed by a trained civilian population to take up arms at a short notice. With Pakistan’s nuclear deterrence in place and its efficacy proved without its lethal appliance in the recent stand off, one hopes that exchanges of good wishes between India and Pakistan on the Republic Day would prove to be a way forward for peaceful co-existence as futility of war has been established time and again.